Stacie sent in this great DIY laundry bag idea, for sorting your clothes without taking up a lot of floor space with a more traditional laundry sorter. Let's face it, "laundry happens!" If not kept under control "the laundry monster" will soon take over every room of your house. So how will you tame the laundry monster? First, figure out where the little laundry monsters like to grow. Usually these places are the bedrooms, bathrooms and laundry rooms. Second, find the correct container to round up the little stinky creatures. Some people prefer laundry baskets, while others prefer rolling laundry sorters. I, however, prefer to use simple white pillow cases with the type of laundry written in permanent ink on the top outside of the case. Ex. whites, darks, colors and towels. Third, choose vertical or horizontal storage. If floor space is available then by all means sort side by side. However, to save space and hide the laundry, hang pillow cases on a wall behind a door. Each pillow case will be labeled so that everyone can sort as they strip. That way, no laundry critters have a chance to hit the floor and make their way under the bed or in the corners. Forth, on the day/days you will be doing a load of laundry all you have to do is grab the bags marked the same (ex. White) from the spots you designated. I try to do a load a day but if I see that the whites bags are not that full then I will wait. Then just dump the contents of the bag into your washer. Remember to check for that stray red sock or the hidden tube of lip chap in the pockets first. 1.One hook for each bag - I prefer the large command hooks that won't damage walls. - you can find white pillow cases relatively cheap. 3. Permanent marker to write types of laundry on top opening of pillow case. 4. Scissors - to cut small ½ inch to 1 inch slit at opening end of pillow case about 2 inches down from the top on opposite of side of where the writing will be. 5. Sewing machine - I do recommend sewing a button hole first and then putting a slit in middle of it. This reinforces the hole so the bag doesn't tear. Bonus: The pillow cases are washable and therefore will always be fresh. 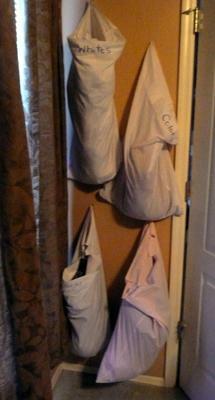 Thanks Stacie for this awesome tip about DIY hanging laundry bags! What a great way to sort as you go, and at the same time save floor space. I love my triple laundry sorter because of the ability to sort all at once, and grab a bag to wash that is already presorted. 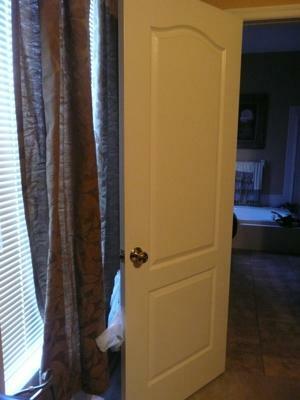 However, you are right, it takes up floor space. Your suggested method of the DIY laundry bags does not. In addition, this suggestion has the advantage of being able to be implemented in several places at once. That means your kids don't even have to walk to the laundry sorter to drop things in, but instead just stuff clothes in right where they take them off, meaning one less step they have to perform to actually keep the house neater. Awesome! Does anyone else have some great tips for how they organize or store their laundry, or other areas of their home? 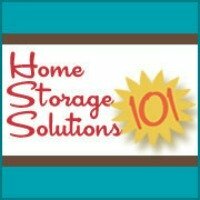 If so, you can share your creative storage solutions and organizing tips here, or read even more that have already been submitted.